I'll start with a spoiler free review that simply sets up the film and documents my impressions of it: I was extremely happy with Into Darkness and so far consider it my favorite film of 2013. It's a sequel that manages to capture all the best parts of the first film and continues the adventure by going into some new directions. From the first moment of the film, we're thrown right into the adventure and drama of the Enterprise crew during an observation mission gone awry on the primitive planet Nibiru. In a scene that pays homage to the intro of Raiders of the Lost Ark, Kirk (Chris Pine) and McCoy (Karl Urban) are running through the planet's vivid, lush jungles being pursued by the indigenous inhabitants. It's all a ruse, however, allowing Uhura (Zoe Saldana), Sulu (John Cho), and Spock (Zachary Quinto) to take a smaller shuttle down into one of the planet's active volcanoes so that a cold fusion bomb can be set off, preventing the volcano from erupting and the planet from being destroyed. When things don't go according to plan and Spock's life is in jeopardy, Kirk willingly breaks the Prime Directive to save him (although everyone is pretty much already doing so by interfering with the planet's destiny). It's a decision that has tremendous impact on Kirk's life and sets up the main theme of the film: what dictates the right thing to do in a given situation? Is it rules and policy? What about morals? Is doing the right thing based upon revenge or recompense? Maybe it's a "gut feeling" that we just have? 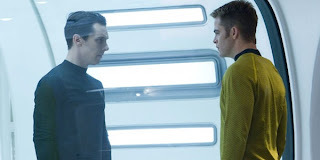 When the terrorist Commander John Harrison (Benedict Cumberbatch) begins a series of attacks against Starfleet installations and personnel, the Enterprise is sent after him with orders from Admiral Marcus (Peter Weller) to kill Harrison on sight. It turns out to be a task that will test the morals, loyalty, and friendship of Kirk and his entire crew, as they must navigate the murky shades of gray that exist in executing justice. Images used for review purposes courtesy of Paramount Pictures. With a solid premise beneath it, Into Darkness really takes off at warp speed with excellent action sequences and satisfying character interactions. 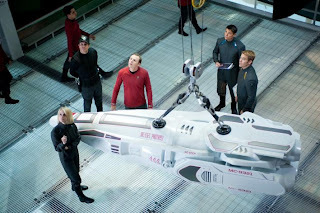 The action sequences provide plenty of opportunity for the stellar cast to interact with one another under a variety of frantic situations, although once again, Chekov (Anton Yelchin) seems a bit underutilized. Scotty (Simon Pegg) gets separated from the crew for awhile, but his adventure plays an important part in the film, making him a key figure in the events that transpire.  Whether it's a phaser shootout against a group of Klingons, traditional Trek ship-to-ship combat, or just good old fashion Original Series styled fisticuffs, there is action aplenty in the film. The action always feels like it fits in well with the story, as well. Regardless of the scene, you'll have a good connection to what's at stake for the Enterprise crew if things don't work out. Warning! There are spoilers ahead!!!!!!! 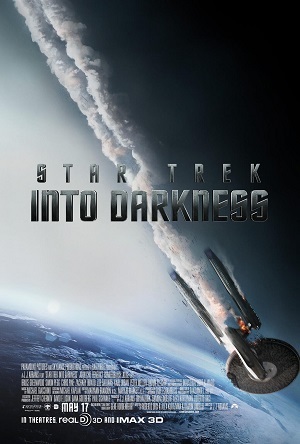 Into Darkness does an excellent job of telling a story that forces Kirk to realize his own infallibality and the shortsightedness in always making decisions based upon his gut feelings. 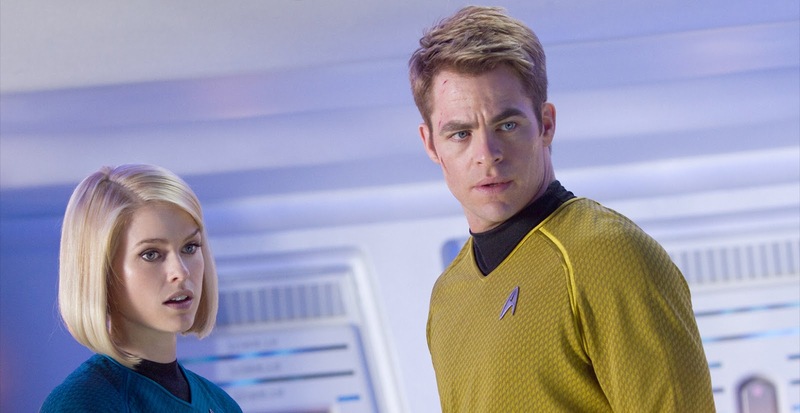 It juxtaposes Kirk's growth with Spock's growth, who learns that logic and policy cannot account for every situation. While we've seen a friendship develop between these two characters, here we see it strained and tested. If Star Trek II: The Wrath of Khan was a powerful film because it dealt with loss and sacrifice in looking at the long friendship between Kirk and Spock, then Into Darkness is a powerful film because it deals with loss and sacrifice occurring at what we know might be the beginning of a great friendship. While I certainly would not call the film a remake of Wrath of Khan, it certainly is a movie that presents an alternate take on that film. Benedict Cumberbatch's excellent villain, always referred to in promotional material as John Harrison, does turn out to be Khan. While Cumberbatch plays Khan differently than Ricardo Montalban, he still retains the power and fury that Montalban originally brought to the character. 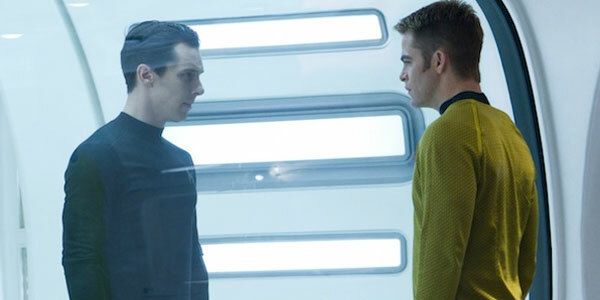 Khan remains a complex and often sympathetic character, and during Into Darkness we see Khan and Kirk as both enemies and partners being forced to work together. It's an interesting dynamic that changes up the story nicely. It truly was thrilling to see those two legendary personalities working together, especially during the amazing space jump scene. While some fans have questioned the decision of the new Trek series in already bringing in a familiar adversary for the Enterprise crew rather than going off in a new direction, I personally see it as validation of what this series has set out to do. If this were truly a new universe, then we wouldn't need to have a Kirk, Spock, Pike, or Uhura. We could simply have all new characters. It's not a completely new universe, however, but an alternate version of the Original Series universe (called the Prime universe) and thus certain things are expected to happen. I see using Khan (certainly the most established singular villain in Trek history) as a way of further stressing the idea that this universe has it's similarities and it's differences. While in some ways Abrams is recreating familiar elements from Wrath of Khan, he also mixes them up enough that it doesn't feel like we're retreading old ground. Perhaps the most extreme example is that while a character still sacrifices their life to fix the Enterprise, it isn't Spock this time. It's Kirk. As a fan of Wrath of Khan, I appreciated what Abrams did: acknowledge the gold standard of Trek while reinterpreting it. 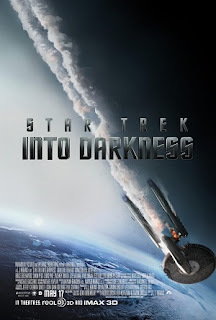 If Spock's death in Wrath taught Kirk the message that their are indeed no-win scenarios, Into Darkness shows Kirk learning that truth for himself in a scenario that mimics the Kobayshi Maru. Do I have any complaints about the film? I didn't upon leaving, but I guess I do have a minor nitpick and one plot choice that I would have changed. The plot change I would have made centers around Kirk's death due to radiation poisoning is resolved rather quickly. 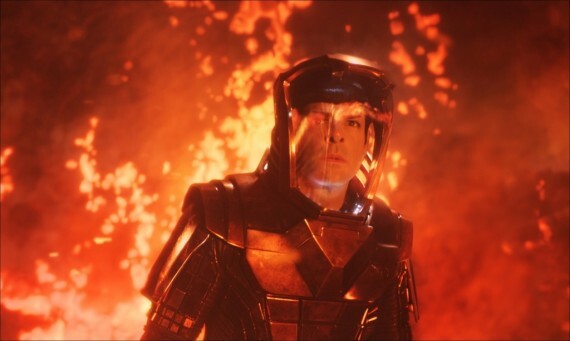 While I certainly wouldn't want to have Kirk permanently deceased in this new universe, I do think that had the solution to his resurrection not occurred until the third film, Into Darkness could have been a stronger film, perhaps even rivaling The Empire Strikes Back (or the Wrath of Khan) in the way it leaves a character in true peril of not returning. I don't mean to be morbid, but sometimes there is great power in allowing a hero to truly die in accomplishing their mission. My other complaints was that Leonard Nimoy's appearance as Spock Prime felt a little unnecessary (surely they could have used him for a better purpose other than just telling his alternate universe self that Khan was dangerous). Personally, leaving this film I was more excited for the future than when I left the first Trek. We have the beginnings of an all out war with the Klingons and a crew that has truly established itself who is now ready to embark on their five year mission to explore deep space Will they be caught in the middle of the war or called to service? Will Khan return? Will Sulu ever get his own ship? (This movie certainly plays with the idea pitched over and over by George Takei of Sulu becoming a captain.) Also, if I didn't feel so before, I now feel that Disney's decision to select J.J. Abrams as the director for the next Star Wars film is completely justified. If it manages to be as solid as the two most recent Trek films, Star Wars fans should be quite satisfied. I easily confirm this film as epic, as it manages to solidly balance character interaction, story, and action into what might possibly be the best Trek since the Star Trek IV: The Voyage Home. This is most definitely a film that I recommend seeing in theaters as it is a truly aural and visual pleasure.